On the morning of September 16, Washington received word that the British were advancing. Washington, who had been expecting an attack, sent a reconnoitering party of 150 men under the command of Thomas Knowlton to probe the British lines. At daybreak, Knowlton's troops were spotted by the pickets of the British light infantry. The British sent two or three companies to attack the enemy. For more than half an hour the skirmish continued, with fighting in the woods between two farm fields. When Knowlton realized that the numerically superior British forces were trying to turn his flank, he ordered a retreat. The retreat was organized and conducted with no confusion or loss of life. The British quickly pursued the Americans and were reinforced with the 2nd and 3rd Battalions, along with the 42nd Highlanders. During the retreat, the British light troops played their bugle horns signaling a fox hunt which infuriated the Americans. Joseph Reed, who had accompanied Knowlton, rode to Washington to tell him what was going on and encouraged him to reinforce the rangers. Instead of retreating, Washington, in what military historian Edward G. Lengel calls "an early glimmer of the courage and resolve that would rally the Continentals from many a tight spot later on", devised a plan to entrap the British light troops. Washington would have some troops make a feint, in order to draw the British into a hollow way, and then send a detachment of troops around to trap the British inside. The feint party was composed of 150 volunteers who ran into the hollow way and began to engage the British. After the British were in the hollow way, the 150 volunteers were reinforced by 900 more men. All the troops were stationed too far away from the British so that neither side could do too much damage to the other. The flanking party consisted of Knowlton's Rangers, which had been reinforced by three companies of riflemen, in total about 200 men. As they approached, an officer accidentally misled the men, and the firing broke out on the British flank, not their rear. The British troops, realizing that they had almost been surrounded, retreated to a field, where there was a fence. The Americans soon pursued and, during the attack, Knowlton was killed. Despite his death, the American troops pushed on, driving the British troops beyond the fence to the top of a hill. When they reached the hill, the British forces received reinforcements, including some artillery. For two hours, the British troops held their ground at the top of the hill. However, the Americans, once again, overwhelmed the British troops and forced them to retreat into a buckwheat field. Washington was originally reluctant to pursue the British troops, but after seeing that his men were slowly pushing the British back, he sent in reinforcements and permitted the troops to engage in a direct attack. By the time all of the reinforcements arrived, nearly 1,800 Americans were engaged in the buckwheat Field. To direct the battle, members of Washington's staff, including Nathanael Greene, were sent in. During this time, the British troops were also reinforced, gathering to about 5,000 men. Despite superior numbers, the British could not hold their ground against the Americans. For nearly two hours, the battle continued in the field and in the surrounding hills. Finally, the British troops were compelled to withdraw, but the Americans kept up close pursuit. The chase continued until it was heard that the British reserves were coming, and Washington, fearing a British trap, ordered a withdrawal. Upon hearing Washington's orders to withdraw, the troops gave a loud "hurrah" and left the field in good order. American forces took positions on northern Manhattan, stretching in a line across the island. Their heaviest concentration was at Harlem Heights, where they were safe from the guns aboard Lord Howe's ships. 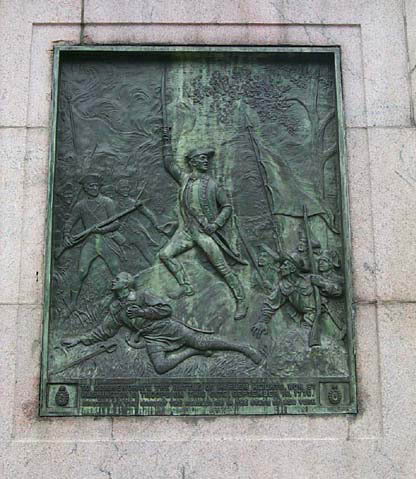 On September 16, the two sides engaged in a skirmish at what today would be Broadway and 106th Street. The American lines held early in the fighting, but gradually began to recede. As the British advanced, a bugler sounded the “Call to Ground” — the traditional foxhunt signal that the quarry had been trapped in its hole. The call was well known to the Virginians and probably grated on their nerves. 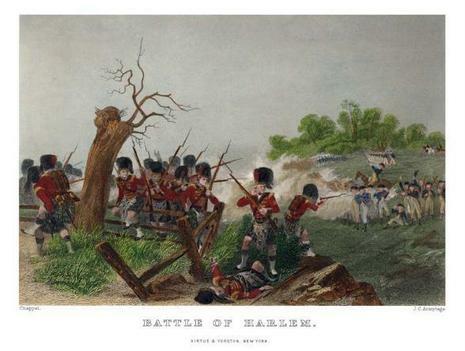 Reinforcements arrived and fueled the British drive as far as present-day 125th Street. General Leslie, the British commander, was rebuked for his performance and a period of relative inaction followed. Both sides rethought their plans and attentions were diverted by the great fire in New York City on September 21.